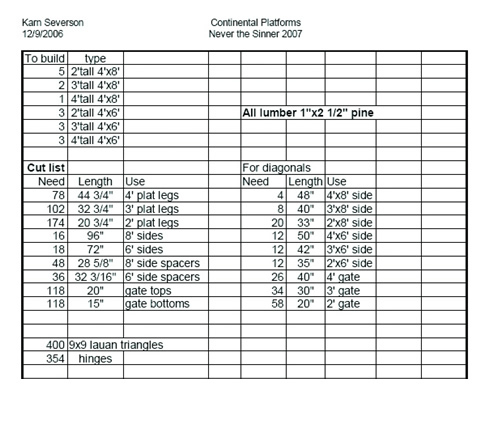 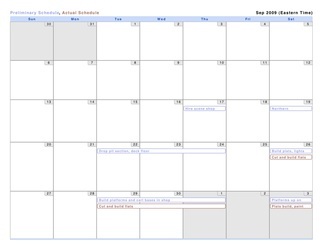 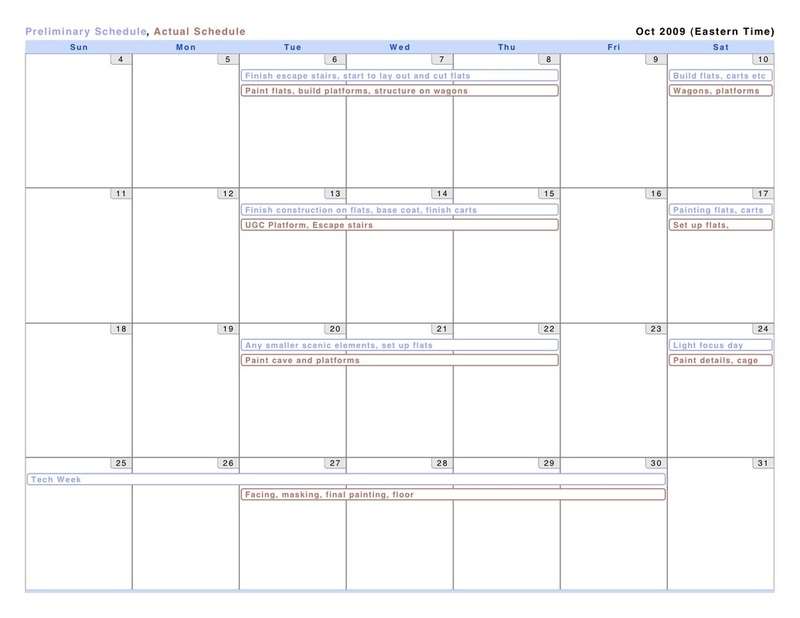 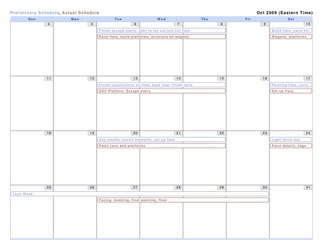 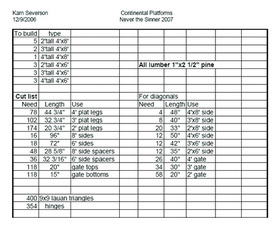 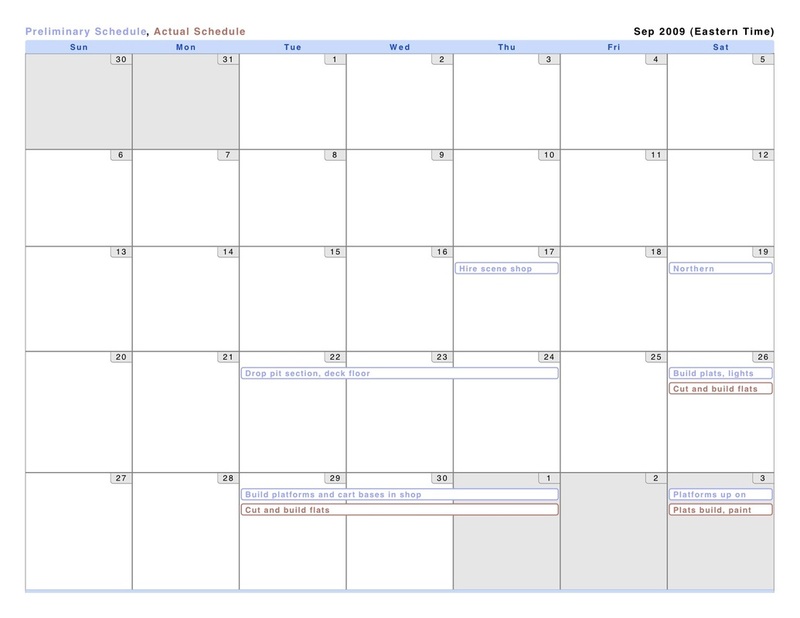 I was technical director for the show, I made schedules for the build and coordinated progress and stage times with other shops. 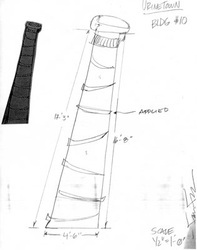 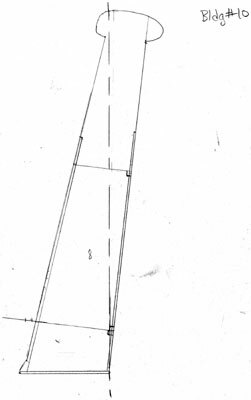 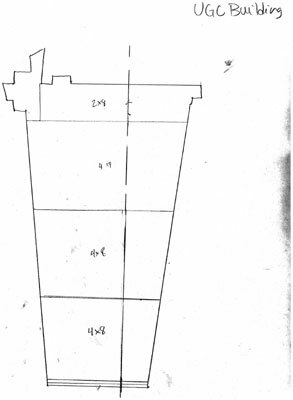 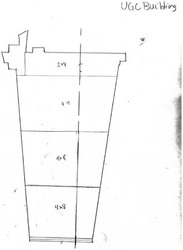 I worked from the information received from the scene designer and made shop drawings for the flats and came up with the process to construct the irregular flats. 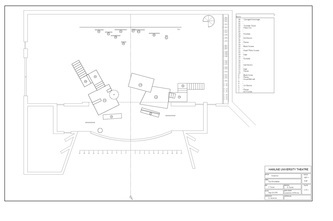 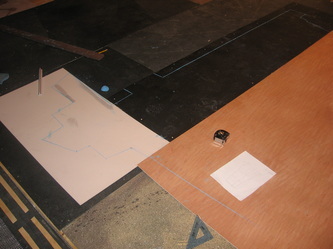 I managed the scene shop and build as usual and also tracked work in other shops. 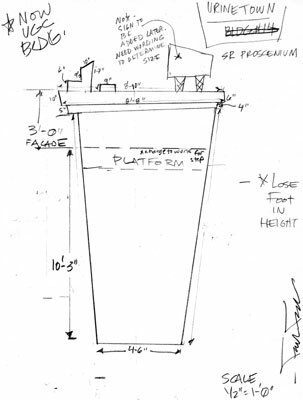 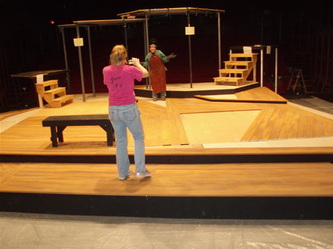 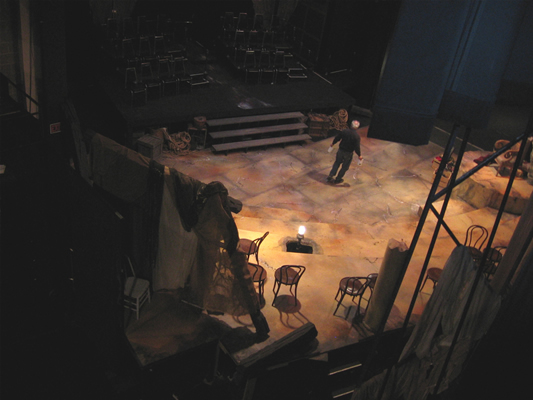 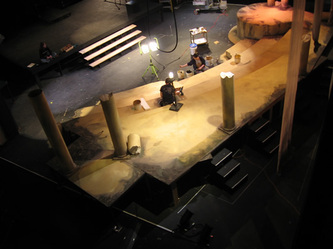 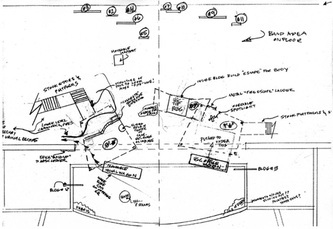 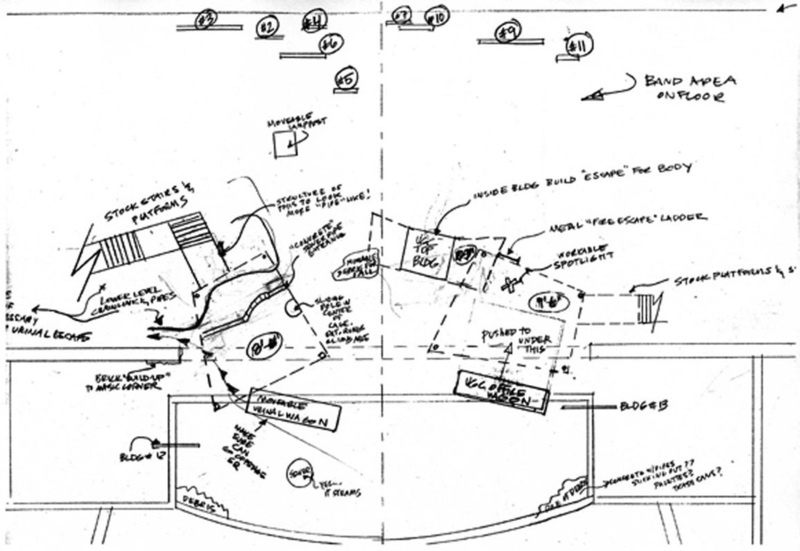 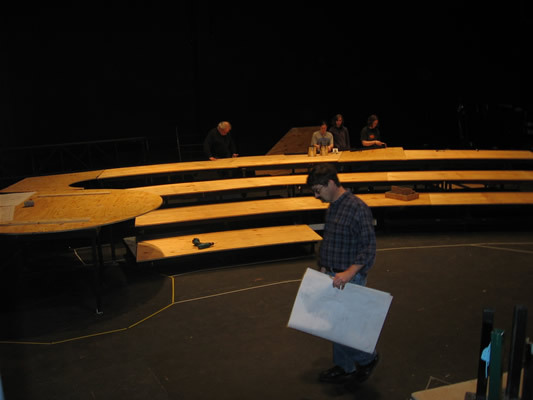 The projects I worked on were setting up platforms for audience seating and acting space, as well as coming up with a process for facing and decking the curved platforms. 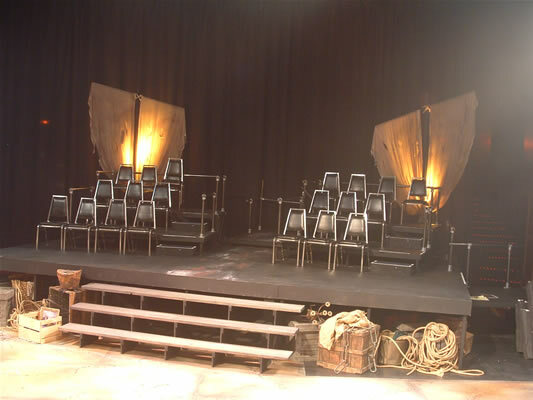 I also painted and decorated the chariot, and helped to paint and distress the set. 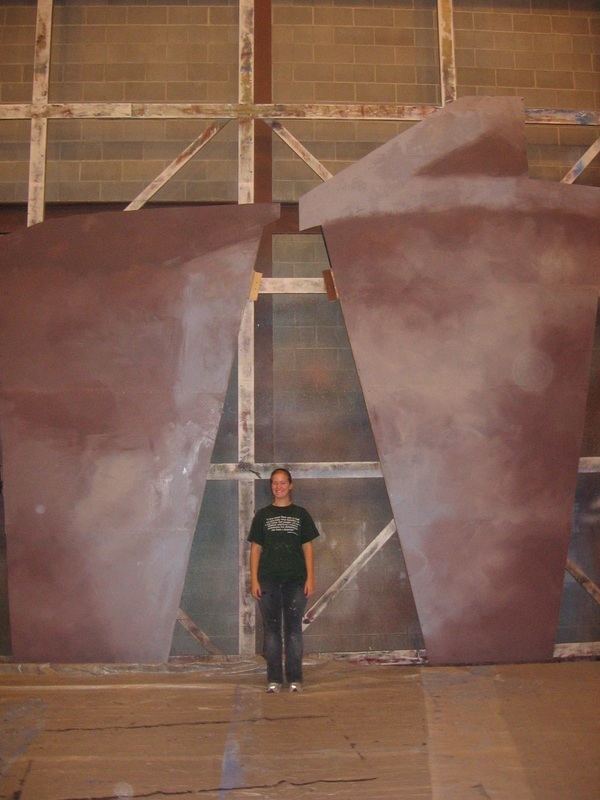 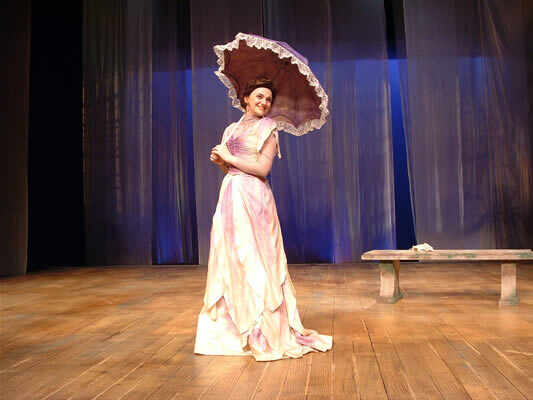 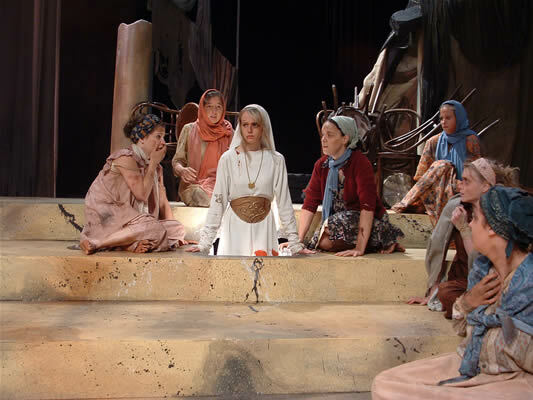 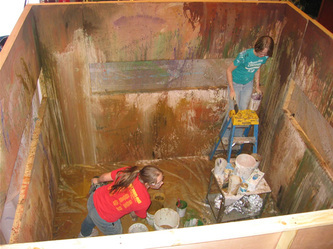 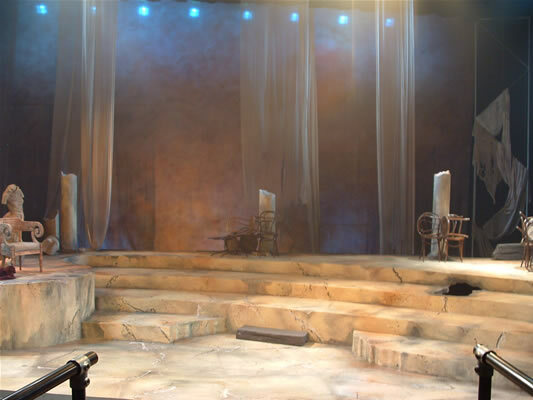 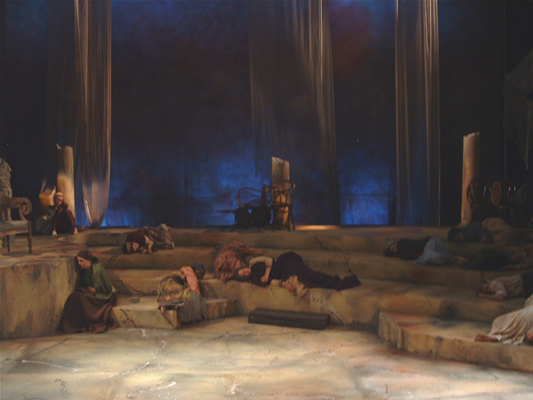 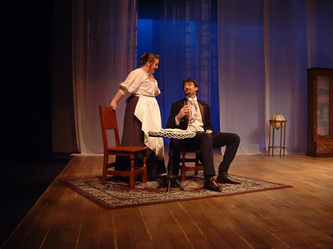 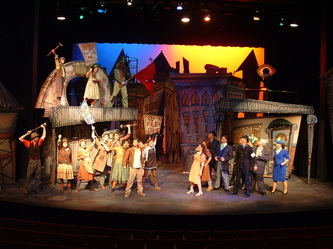 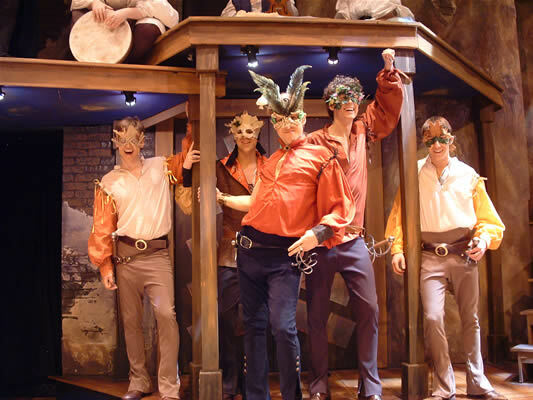 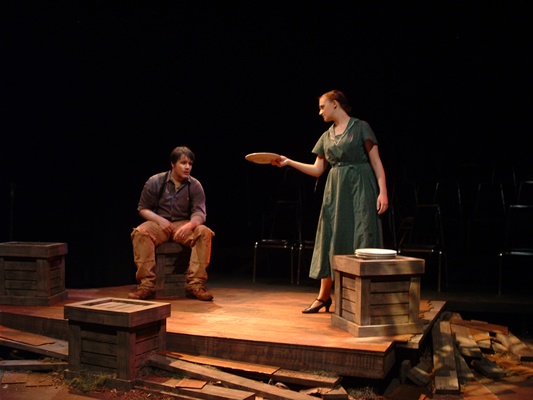 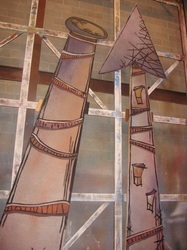 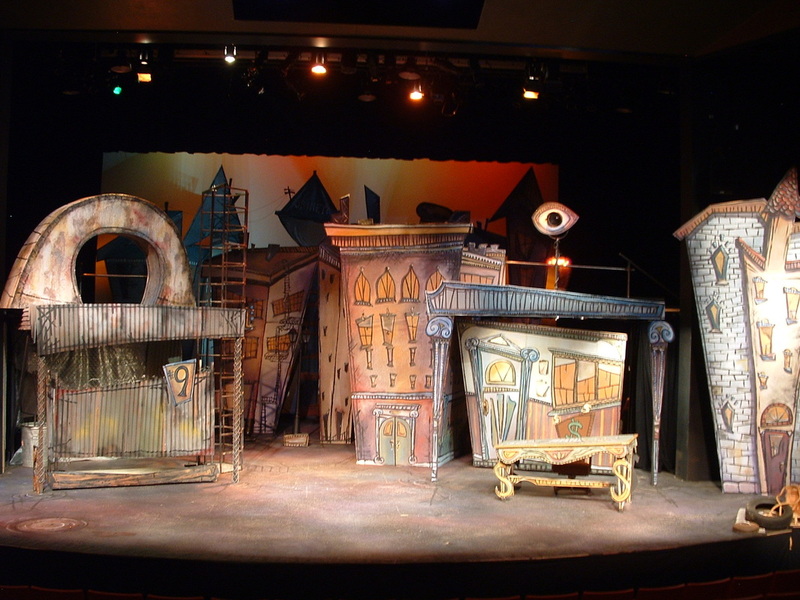 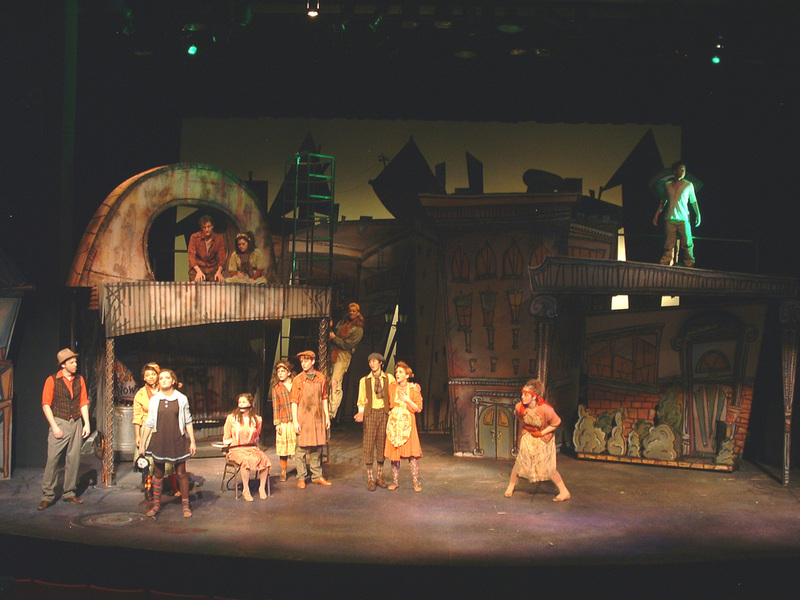 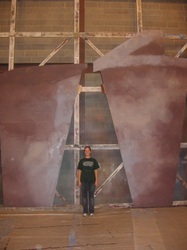 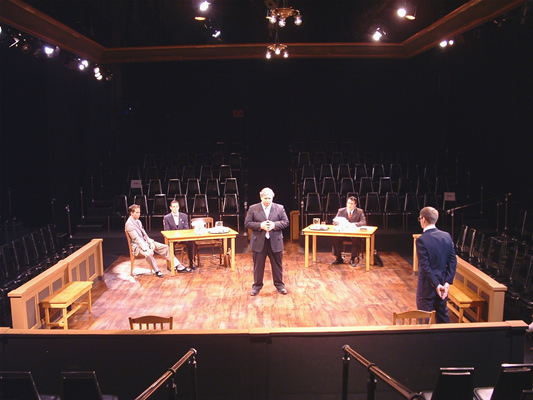 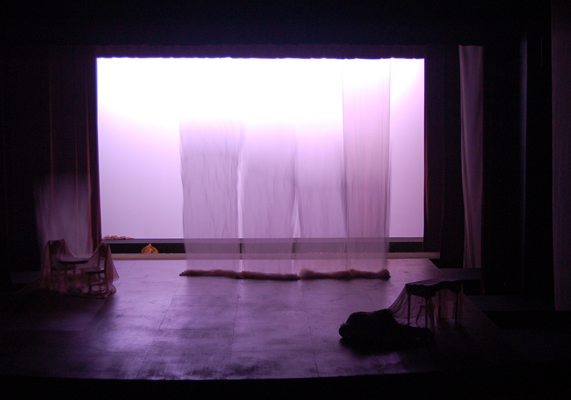 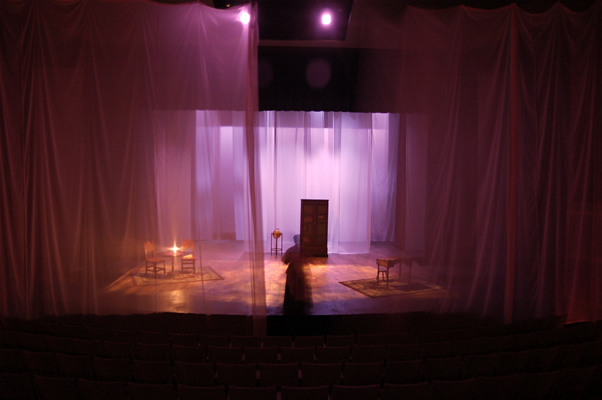 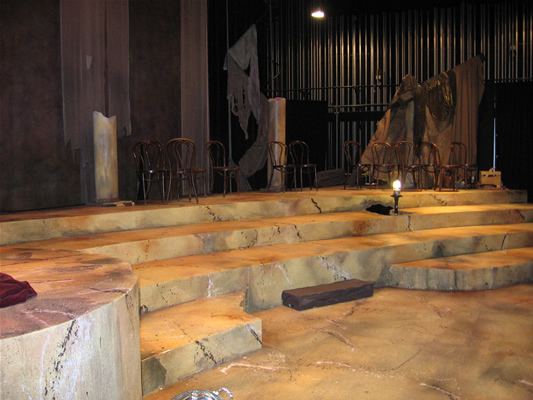 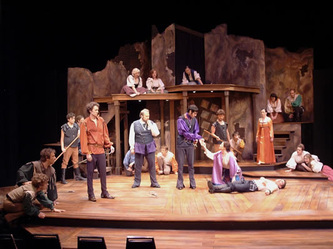 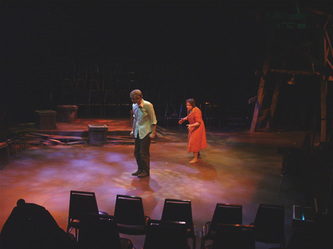 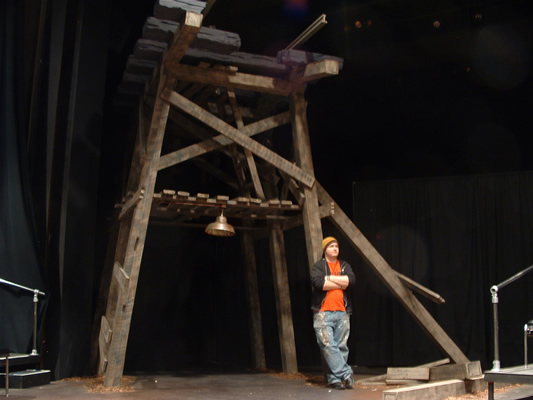 I was the scenic designer for this show, and led the construction as well. 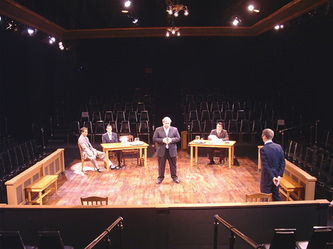 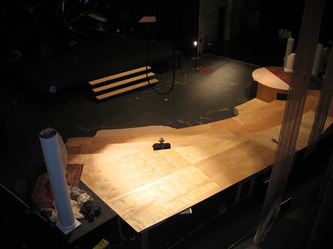 Projects I led were building platforms, painting and laying floorboards; building and painting flats, doors, stairs and ceiling; configuring audience platforms; and planning out masking. 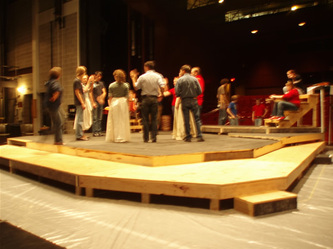 There were also scene shop members involved in the show who had to be in rehearsals, so the remaining employees and I pulled extra hours to get the show to the usual level of finish. 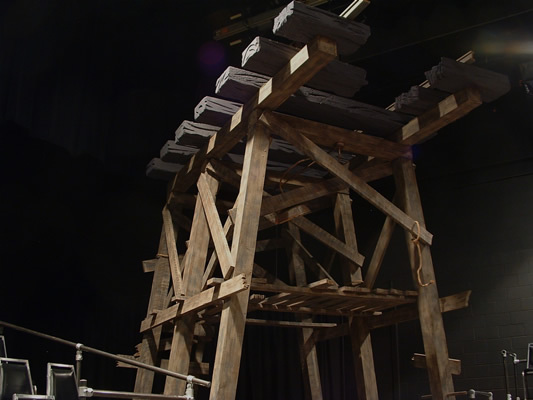 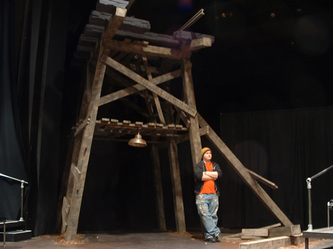 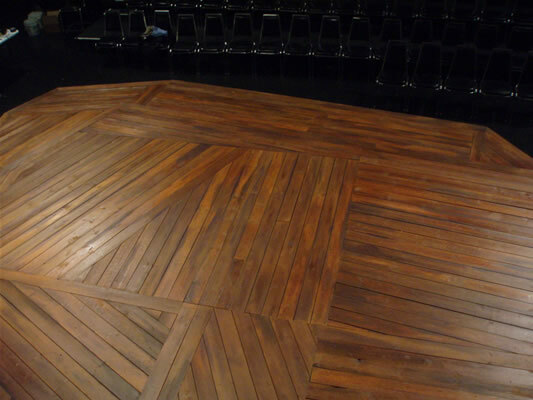 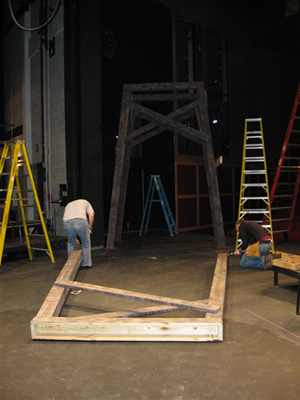 For this show, the projects I worked on were constructing and painting the trestles; laying and distressing floorboards; installing boards to create platforms and ladders on the trestles; and painting the floor. 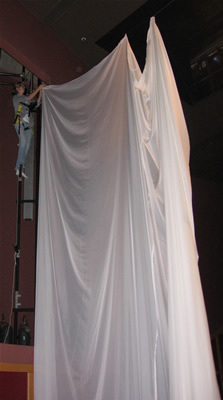 The projects I worked on were building the raked platform, rigging the front drape across the apron, rigging the cloth panels to drop when triggered offstage, and painting the base of the floor. 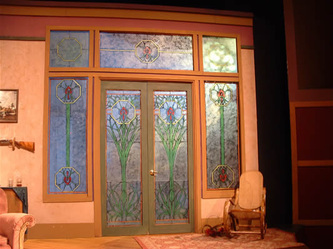 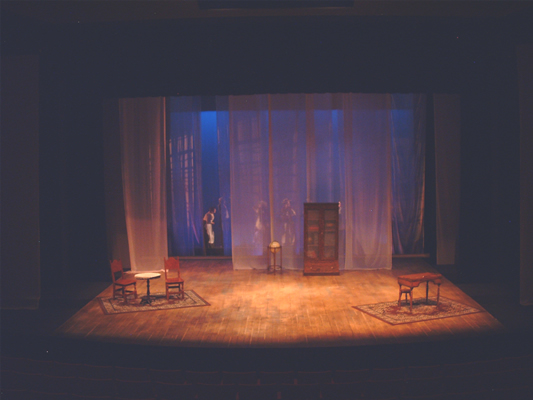 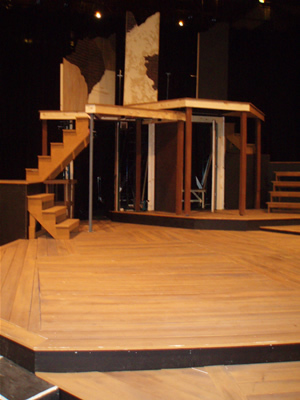 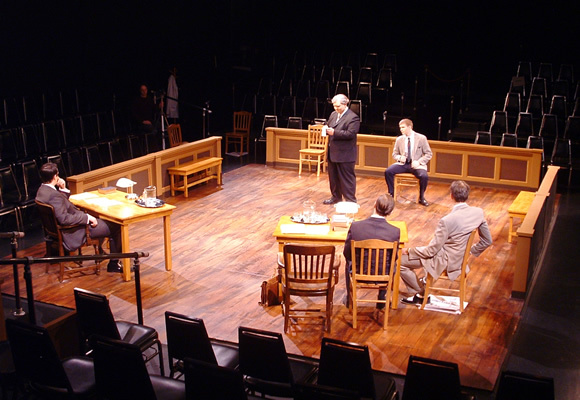 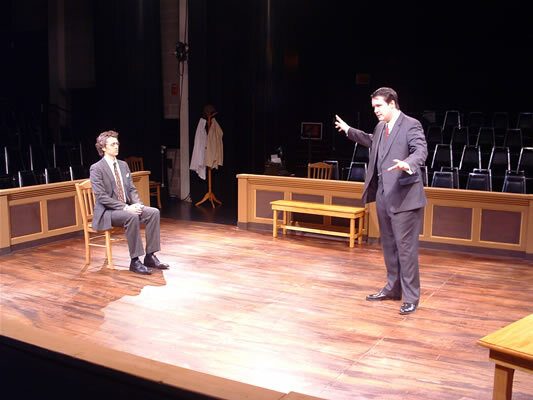 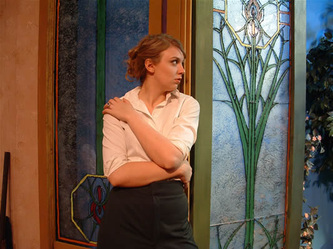 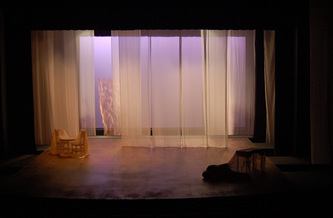 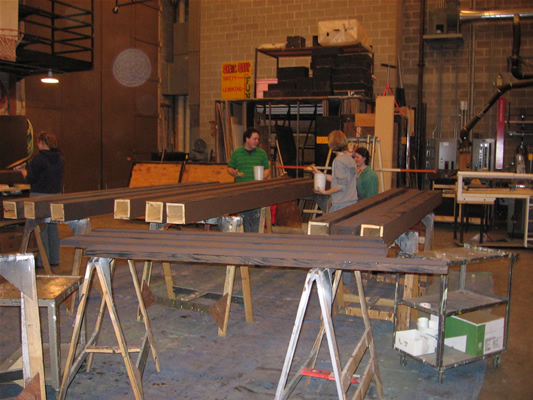 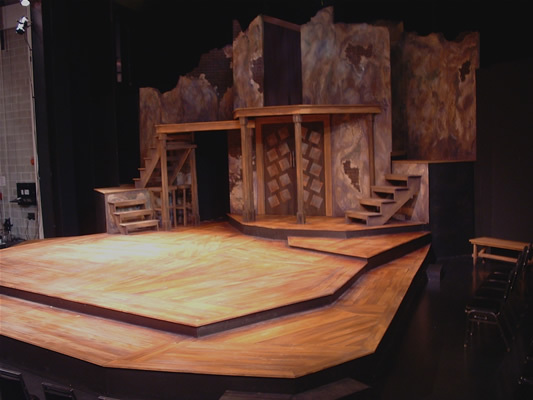 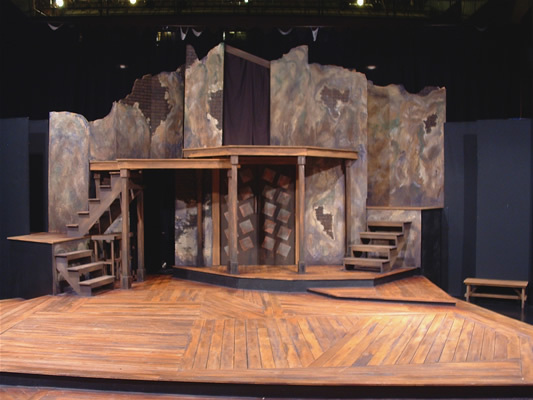 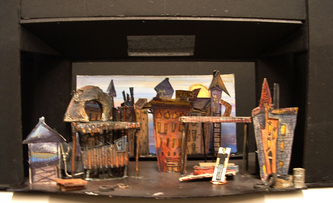 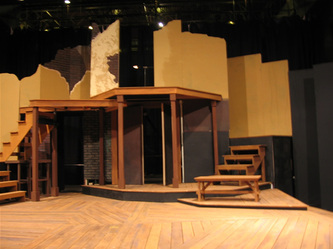 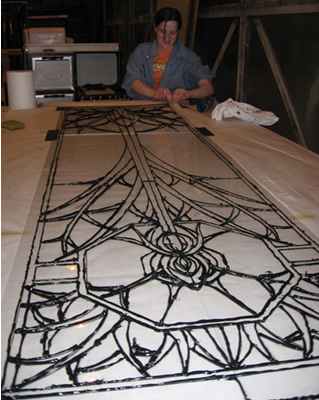 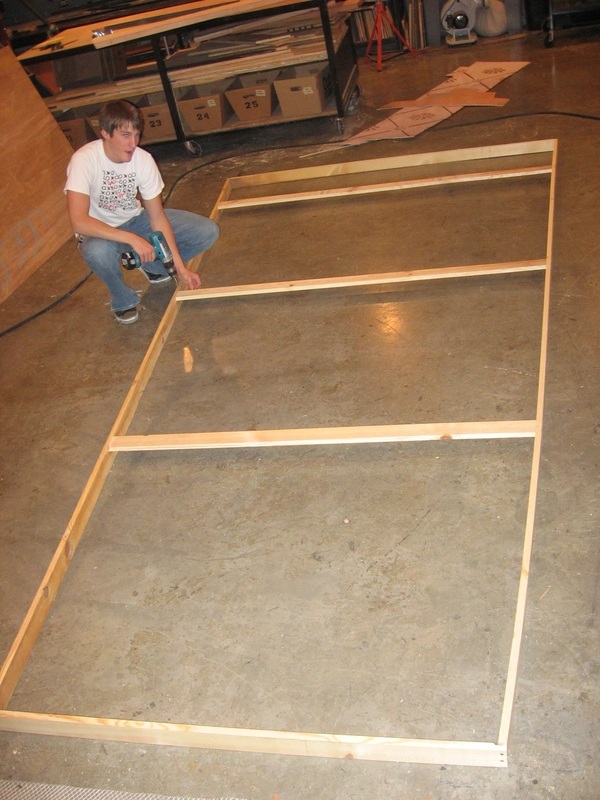 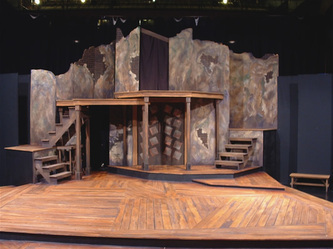 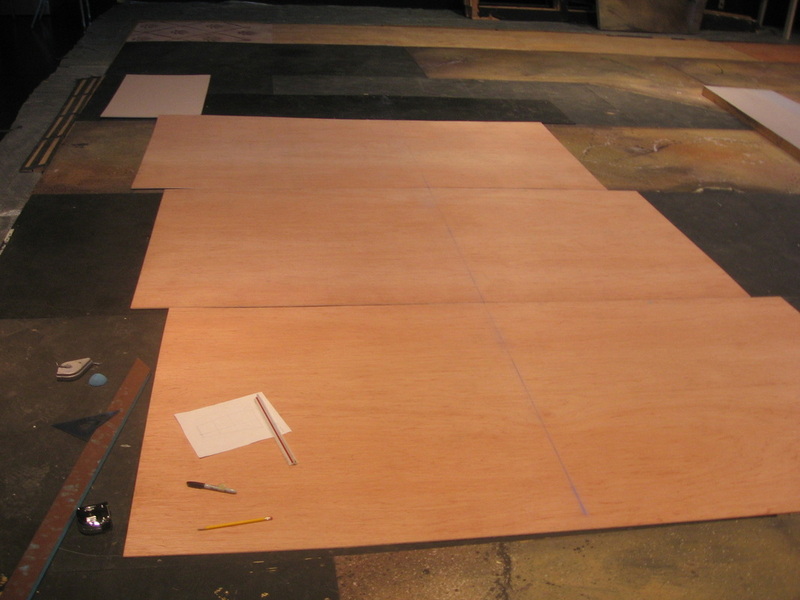 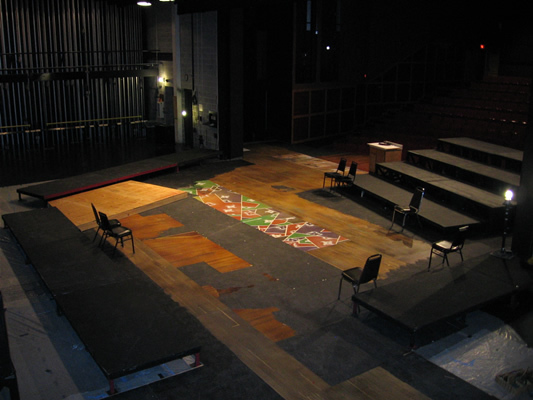 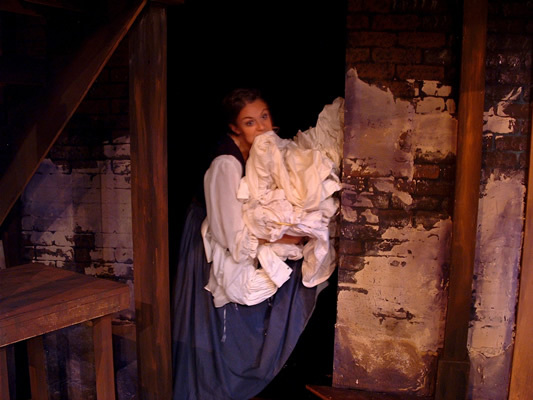 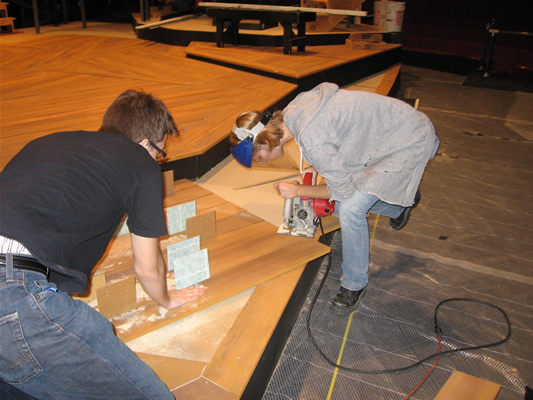 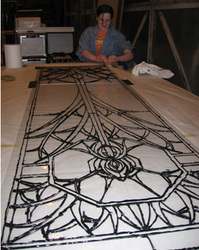 The projects I worked on were constructing specially sized flats for the doors, attaching foam crown molding, making stained glass out of Plexiglas and caulk, and painting and texturing the 10x10x10 foot box for one of the scene locations that the audience travels to in the second act. 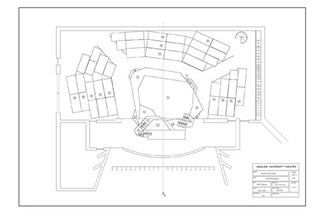 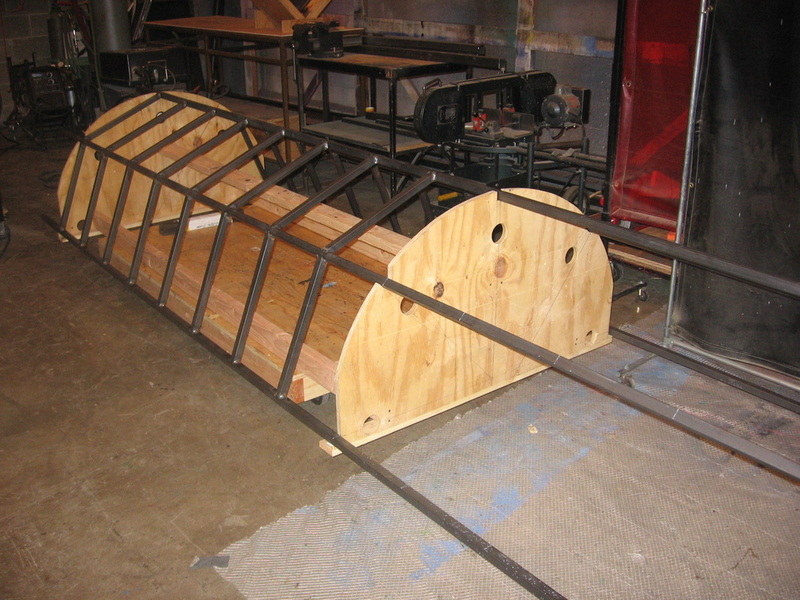 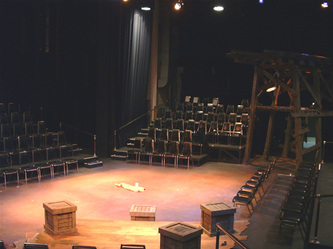 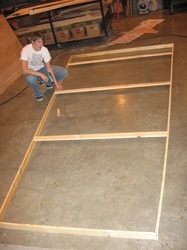 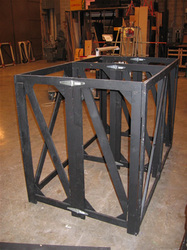 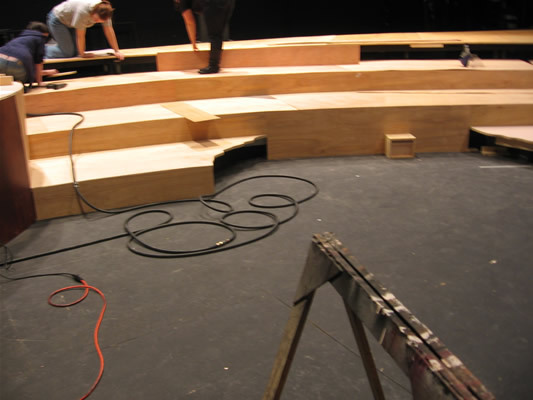 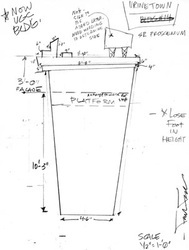 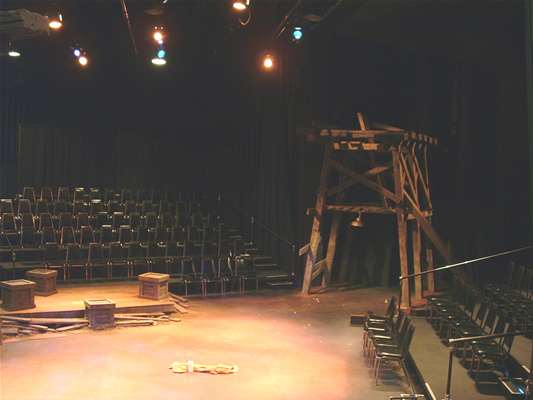 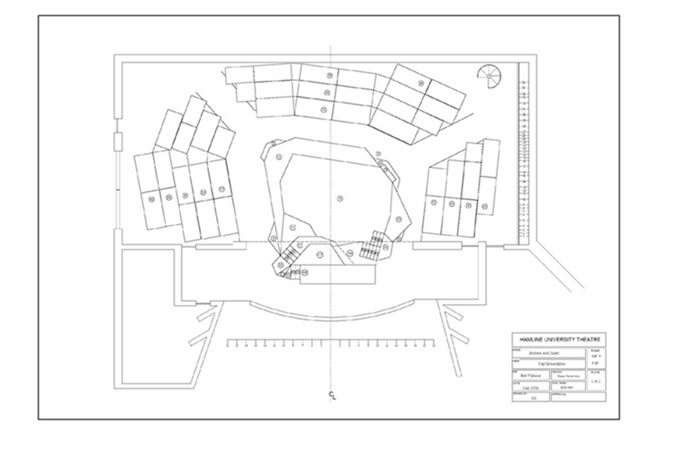 I led construction for the modular audience seating units, used for shows in the round. 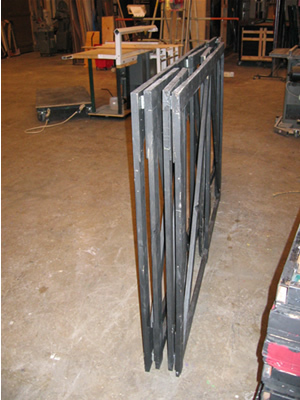 I painted the base coat of the floor, and constructed and painted the court railing panels for edges of stage.